You’ve decided to undertake an outdoor DIY project, and you’ve determined that you want to incorporate a mosaic piece into the space. First things first, you need to know the lay of the land and how to actually design a mosaic, as this is one of the most important steps in all mosaic tile projects. This fool-proof guide will walk you through all of the preparatory work necessary to successfully design your outdoor mosaic and ensure that you’re armed with the knowledge to get started. Get ideas about what type of mosaic tile project you would like to do. This can be anything from adding mosaics to an outdoor fire pit, creating a mosaic tabletop, or making mosaic flower pots. Browse Pinterest pages and DIY articles for inspiration, which are also great references in determining the difficulty level of various projects, the amount of time that is required, and the associated costs. If you need some ideas to help get you started, consider these 6 DIY ideas for an impressive mosaic-inspired backyard. Once you have your vision in mind, it’s time to pick your colors. Consider whether your piece has a theme and what mood you’re trying to set. A relaxed, nautical theme that is meant to stimulate feelings of relaxation might have deep blues and greens, whereas a busy, Parisian cafe-inspired theme that is meant to incite high energy might have vibrant reds, yellows, and oranges. Keep in mind what the purpose of the piece is—a mosaic tabletop for eating is likely where lots of conversation will take place, whereas a mosaic birdbath might be intended for a tranquil spot dedicated to bird watching and nature appreciation. The theme, mood, and purpose of the piece should all be considered when selecting your colors. For help, consult the color selector tool for ideas. Choose the tiles that you want to use for your mosaic piece by determining what size tiles you would like, and whether you want to purchase them ready-to-go or would prefer breaking them up yourself. Purchasing tiles and then using a hammer to break them down to the size you want adds a unique, one-of-a-kind quality to the piece. 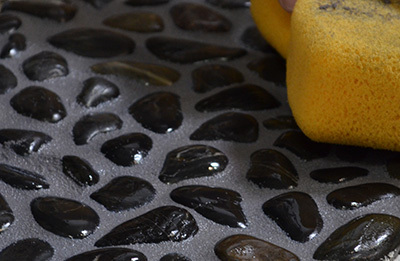 If you would prefer that your mosaic have more uniformly sized pieces with cleaner edges, it’s probably best to purchase tiles that are already the size you want. It’s always important to perform a dry run before ever gluing anything. Draw your design out onto your surface, and then lay your tiles down. This is your opportunity to get creative. Put the same colors together, mix them up in rows, or make a fun shape. Remember, there is no wrong way to design your mosaic, so have fun with this step. 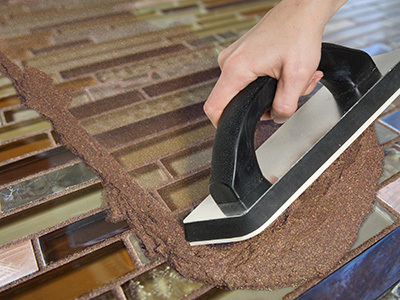 You’re now all set for the installation process, which includes gluing the tiles, grouting the piece with the TEC® Skill Set™DesignColor™Grout or similar product, and sealing it. All that’s left now is to enjoy your outdoor mosaic. If you’re ready to get started on a mosaic project, consider learning more about creating a colorful mosaic tabletop for your backyard. For more summer and backyard inspiration, visit our Pinterest page or subscribe to this blog.